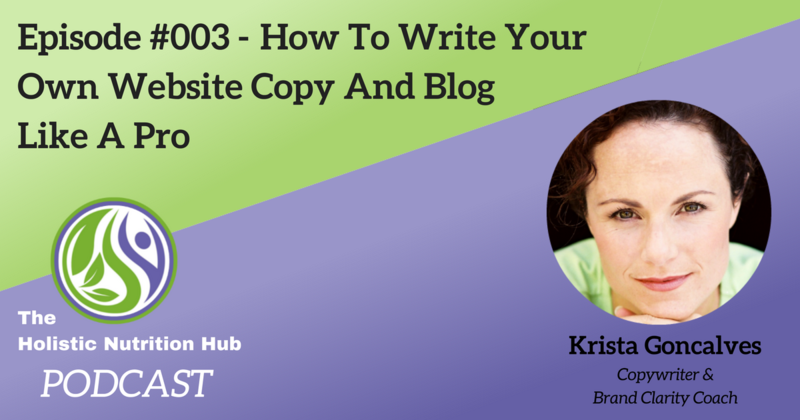 In this week’s episode, I interview Krista Goncalves, Professional Copywriter & Business Coach, on how to write your own website copy and blog like a pro. Krista Goncalves is a former Holistic Nutritionist, turned Copywriter & Brand Clarity Coach for Health & Wellness Practitioners. She lives in Kelowna BC with her husband and two young, active kids. When she’s not writing (or being a complete word-nerd), she’s outdoors hiking, paddleboarding or doing bootcamp in the park or on a beach! While Krista enjoyed her combined 10 years as a Fitness Trainer, Bootcamp company owner & Women’s Health Expert, she’s now incredibly passionate about helping other Health Pro’s to “juice up their online businesses” with her blog & web content writing, and business coaching resources on her own website and blog: Making Lemonade with Krista Goncalves. Pingback: What are the differences between content writing and copywriting?